Our downloadable AS9102 Rev. B forms are Excel file format with unlocked sheets and cells. Please download our FREE AS9102 First Article Inspection forms (AS9102 Rev. B forms 1, 2 and 3) to improve your AS9102 process more easily and efficiently. Once you download our AS9102 Rev. B forms, you can manually fill out the forms on EXCEL or othe spreadsheet software. However, it would be much easier to fill out the AS9102 Rev. 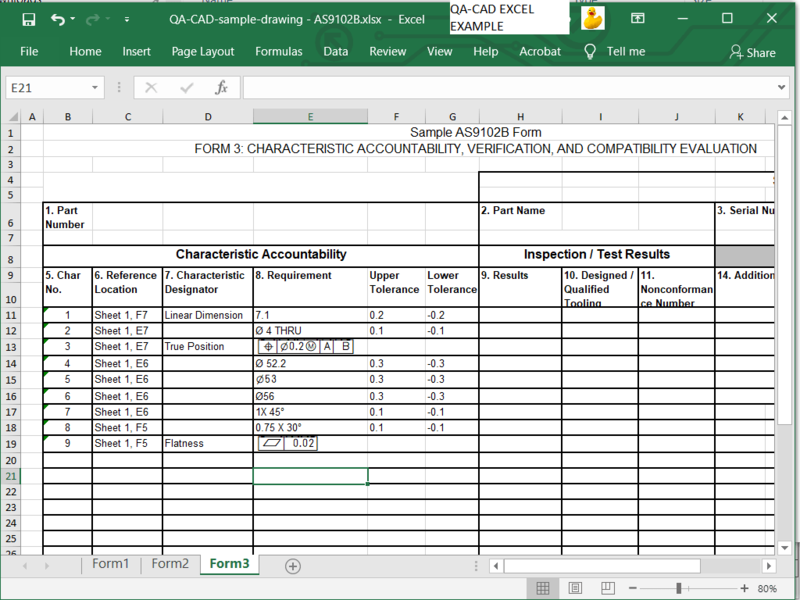 B forms by our First Article Inspection Software, QA-CAD 2019. Watch this short video clip to find out how fast and accurate QA-CAD helps you to complete AS9102 process! The evaluation version of QA-CAD is enabled for 21 days with no limit. Buy a standard license. Prices starts from $695 USD. You can see details of the price structure from here. Buy a network license. Prices starts from $1185 USD. You can see details of the price structure from here.